In order to keep shops and workplace areas cool, the CB-30 uses ordinary tap‐water combined with forced air to reduce air temperatures by as much as -3°C. Best of all, it’s a super-effective cooling device that costs about a dollar per day to operate. 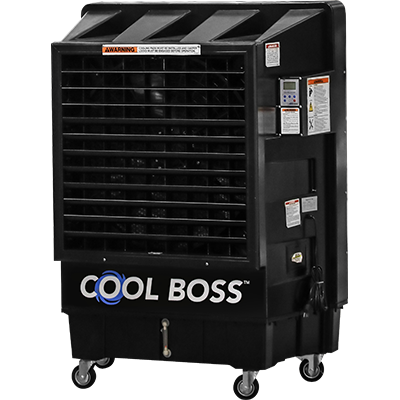 Not to be overly repetitive, but one dollar is incredibly cost-effective—no fan or air conditioning device compares to the cooling potential and savings that are possible with the CB-30 Cool Boss™ swamp cooler. Cool Boss features a micro-computer programmed control panel with LCD display and comes with a convenient remote control. A built‐in timer allows the unit to be programmed to turn on or off at pre-selected times. One large 762 mm diameter fan operates at three selectable speeds, and a thick cooling pad ensures even water distribution and reliable heat absorption. Automatic swing‐louvres oscillate side-to-side and help circulate cold air more efficiently, providing a larger cooling area than traditional evaporative air coolers. Four rubber casters with brakes allow easy mobility.